Wine is an intimidating topic to many people, and making it at home might seem like too much of a challenge. Red or white? Stainless or oak barrel aging? Fresh grapes or wine-making kits? Have you asked yourself these questions? If so, you are among the many who have wanted to make wine at home and didn't know where to start. The Joy of Winemaking will take you on a journey into the wonderful, complex world of wine and guide you step-by-step through the winemaking process. You'll be introduced to the history of wine, which dates back to before 600BC, and learn some of the top wine grape--growing regions, as well as grape varietals. With beautiful full-color photographs that show the whole process from picking the grapes to corking the bottle, The Joy of Winemaking will take you through the multiple steps of winemaking. From choosing the right equipment for crushing and pressing or processing your winemaking kit properly. 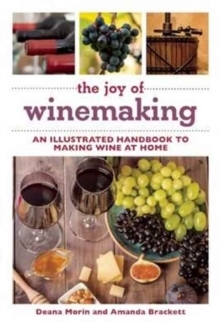 This simple yet detailed book will walk you through the proper way to inoculate and ferment your wine and the use of chemicals for storing your wine properly for years to come. Skyhorse Publishing, along with our Good Books and Arcade imprints, is proud to publish a broad range of cookbooks, including books on juicing, grilling, baking, frying, home brewing and winemaking, slow cookers, and cast iron cooking. We've been successful with books on gluten-free cooking, vegetarian and vegan cooking, paleo, raw foods, and more. Our list includes French cooking, Swedish cooking, Austrian and German cooking, Cajun cooking, as well as books on jerky, canning and preserving, peanut butter, meatballs, oil and vinegar, bone broth, and more.